Artists of South Whidbey February demonstration features guest Artist Ron Stocke, 11:30 a.m. on Tuesday, Feb. 9. Stocke, a signature member of the American Watercolor Society and the NW Watercolor Society, is an elected member of the Canadian Society of Painters in Watercolor, and a member of the National Watercolor Society. Ron paints and teaches workshops in America, Canada and Europe throughout the year. 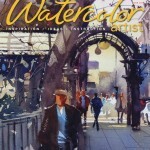 Ron says,” I believe watercolor is simply the best medium to capture light, shadow and reflective surfaces and I exploit this in most of my work.” His work was on the cover of the June 2015 issue of Watercolor Artist Magazine and he was a featured artist in Splash 17 published by Northlight Books in 2015. Ron’s works were in the NW Watercolor Society’s 75th International Open Show in Seattle and in the Members exhibition in San Pedro.Ca. Stocke also participated in the American Watercolor Society’s 148th International exhibition in New York in 2015. The demonstration will happen at the Trinity Lutheran Community Building, 18341 SR 525, Freeland. There is a sack lunch at 11:30 a.m, business meeting and art discussion from 12 to 1 p.m. and the demo will start at 1 p.m. This is a free event. Contact Gaylen at 360-331-2603 for more information.